This weekend I plan to use the rainy days to my full advantage. I’ll hop uptown for an exhibit on the costumes and personal style Katharine Hepburn, then come back downtown for a screening of Amour, which recently garnered a Best Actress Oscar nomination for Emmanuelle Riva’s performance (Riva also starred in one of my very favorite films, Hiroshima mon amour). 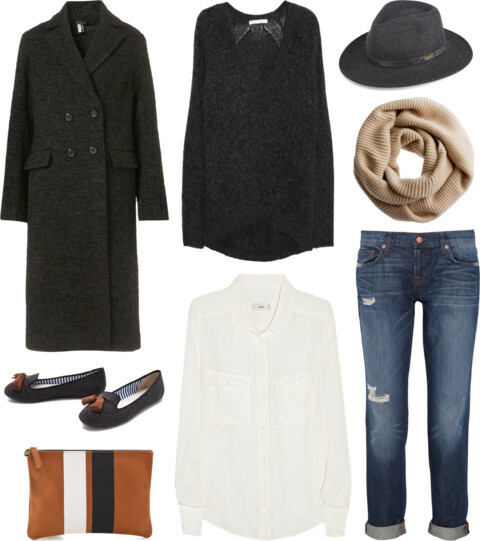 This outfit would be perfectly cozy for traipsing about this weekend, and I even included a charcoal version of my new favorite Pendleton hat (on sale!). Sidenote: Quite Continental Breakfast is something that I used to put together a while back and have decided to revive. It’s a shortlist of items I’ve collected over the week that probably won’t warrant a post on QC, but I thought they might prove interesting for your weekend perusal. Have something to recommend? Please definitely send it my way! The Economist recommends you read my firm’s annual report on the top geopolitical risks for the year with a stiff whisky. I shan’t disagree with that. You can find the report here. Have spent many, many minutes perusing the beautiful and unique travel destinations on Welcome Beyond. Definitely check out the Treehotel, a property in North Sweden that is made up entirely of tree houses! Quite enjoyed these photos of gangster Mickey Cohen and wife at home in Los Angeles in 1949, via LIFE. Cohen served as the real-life inspiration for Sean Penn’s character in the film Gangster Squad, which opened today. Also, did you know one of Mickey’s henchmen, Johnny Stompanato, was stabbed to death by the 14 year-old daughter of Lana Turner? Me neither! Former Menswear Crush Hackett London had their first-ever show this week. You can view their perfectly British Autumn/Winter 2013 collection via Vogue UK. Completely obsessed with the photography of African cultures by Carol Beckwith and Angela Fisher. Especially the pictures of the Dinka people of South Sudan — AMAZING! A bit of vintage interior inspiration, in the form of a converted warehouse via HouseToHome. Lastly, an amusing little alphabetical list of important architects and their best known building. You are currently reading QC Prêt-à-Porter || The Greys at Quite Continental.